A small town, Búzios is a little over 8 kilometers long. The signage throughout the town is efficient, indicating the beaches, the main streets and inns. It is not difficult to get around. The José Bento Ribeiro Dantas Road is the main avenue and cuts almost the entire town, stretching from the entrance porch to the Praia dos Ossos beach. When the avenue gets to the city center, it becomes known as Rua das Pedras (where car traffic is not allowed). A little further ahead the name once again changes to Orla Bardot, which continues until the Praia dos Ossos beach. 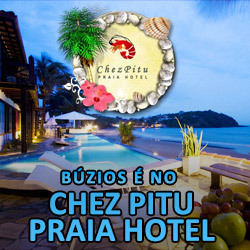 From there, you have access to the Azeda beach, one of the most beautiful in Búzios. The José Bento Ribeiro Dantas Road, before you get Downtown, branches off into several secondary roads that lead to the Geribá, Tartaruga, and Ferradura beaches, among others. There are several accesses to Geribá beach. The main access is in the clover located in Manguinhos, a neighborhood that houses several street shops, like drugstores and supermarkets. The Manguinhos clover is located about 800 meters after the entrance porch. The Ferradura beach can be accessed through the clover located next to the Esso gas station. About 300 meters before that, to the left, is the access to Tartaruga beach. Another important road in Búzios is the Usina Road. It leads to beautiful beaches like João Fernandes, Forno, and Brava. For those without a car, the town offers minibuses that run the length of the main street (José Bento Ribeiro Dantas Road). Outsourced vans also make the same itinerary. Taxis can be caught easily Downtown headed to any beach or destination. A run from Downtown (Rua das Pedras) to João Fernandes or Geribá beach, for example, takes less than ten minutes and costs around R$ 25. Another option is to take a city tour and get to know several spots and beaches at once. However, to better enjoy each place, the best choice is to have a car or rent one there because, although the city is relatively small, the beaches are distant from each other as well as from the main road that cuts the city and through which public transport runs. 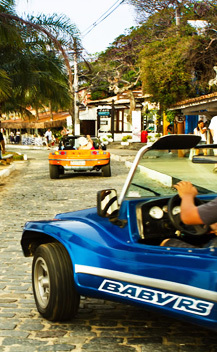 In addition to traditional taxis, Búzios has a special fleet! We are talking about the water-taxis, small boats that travel between some of the beaches. Because it is a delight, the ride is suitable even for those who are not too lazy to walk. The trips cost between R$ 5 and R$ 10 per person. Most taxis depart from the Praia dos Ossos beach and take you to Azeda, João Fernandes and Tartaruga beaches. Alternatives routes are Azeda x João Fernandes and Ossos X Downtown. When renting a means of transportation you can choose between a scooter (motorcycle), a buggy and a car. During the summer and on holidays it is convenient to book in advance. The rates vary according to the time of year. One of the most practical ways to rent a car or buggy is to request this service directly to Búzios’ hotels and inns, which can provide information and book the vehicle for you.